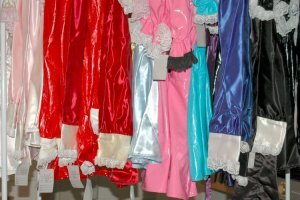 raincoats, and lots of neat sissy stuff!!! Sarah Bright Productions: Sissy Maids, etc. 160728 @LadyBowsafeen has her own private dungeon. 141022 Links Page updated; new links added. 050803 Look at Sissy Maid Chantelle! Chantelle was the star of a photo shoot on the 3rd. Here, Chantelle sports a lovely holgraphic gold-and-silver victorian maid uniform. More will be posted soon! 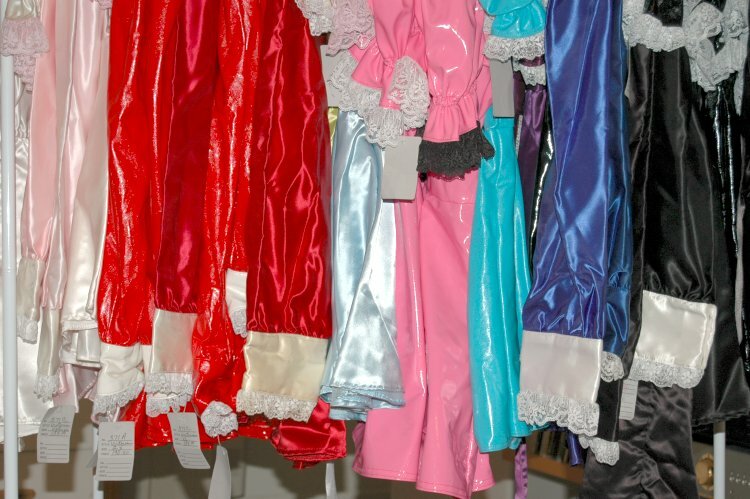 The Web Maid is looking for more Sissy Maid models in Southern California! Interested in this uniform? Ask The WebMaid. 050611 Ohio: Public Maid Club Outing 16th!!! email The WebMaid. 050602 Wanted: Sissy Maid for Photos in So Cialifornia: email The WebMaid. Here are Sissy Maids Claire and Elita (unfortunately, out of uniform!) at a club called Alternative Socials in Indianapolis which is very CD/TV/TG/TS friendly. This is Maid Claire's first public appearance. She enjoyed it so much that she will be there next Friday night and encourages all maids to do the same! Please send updates, comments, requests, etc. to The WebMaid. - dedicate your mind and your time to the worship of Mistress/Master? After having answered this question, the girl shall write down her most typical characteristics as a maid. Note that she has to write directly into the form. Do not cut and paste. The form will not be transmitted, but the girl will receive some advice from the Mistress when pushing the bar below.